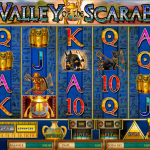 The Valley of the Scarab is a video slot game from Amaya that is based on Egyptian superstition. Namely they believed that this odd insect had mystical abilities. What is left to us is to believe in its power and to hope that it will bring some wins our way. That is all we ask for after all. The design of the game is surreal and all the symbols represent a part of the Egyptian culture. There are a couple of symbols that we want to see more often on the reel in The Valley of the Scarab. One of them is the scarab beetle symbol which represents the wild. It can appear stacked on the reels and its function is to stand in for every other symbol to complete a winning line, except for the scatter. 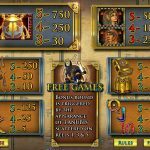 Anubis is the scatter and it is the key to the main feature, the free spins round. You need to land the scatter on the first, third, and fifth reel to receive 7 free spins. Every win during the feature will receive a random multiplier between x2 and x8. It is also possible to retrigger the feature if you land the necessary number of free spins. 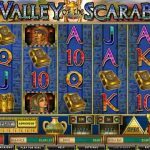 The Valley of the Scarab is a nice video slot game that we usually play when we have the chance to. This game comes from Amaya, and that tells us a lot. All of their games are of high quality, visually and the game play is so nice and engaging. We have only one special feature in this game but if you are lucky it can be quite profitable. So, for this reason only we advise you to give this game a chance, we are sure that you will love it. For another great engaging slot consider playing Thundering Zeus a 5 reel slot by Amaya.